Self-healing materials are able to repair autonomously defects, such as scratches, cracks or dents, and resume their original shape. For this purpose, they must be composed of several components whose combined properties result in the desired characteristics. Scientists of the Karlsruhe Institute of Technology (KIT) and the Technion – Israel Institute of Technology now discovered that also tiny particles of pure gold have surprising self-healing capacities. Lending shape memory to materials is a very complex, painstaking effort. In pure metals, self-healing capacities repairing mechanically caused defects so far have been considered impossible. However, they have now been observed by scientists in pure gold. This is reported in the Advanced Science journal. "The search for materials of this kind so far has been concentrated on polymers made up of many components and complicated structures," states Christian Brandl of the Institute for Applied Materials – Materials and Biomechanics (IAM-WBM). Their self-healing powers were all based on the collective transformation of the phases of one or more materials making them up. This is caused, for instance, by heating, melting or precipitation, which may change materials properties. 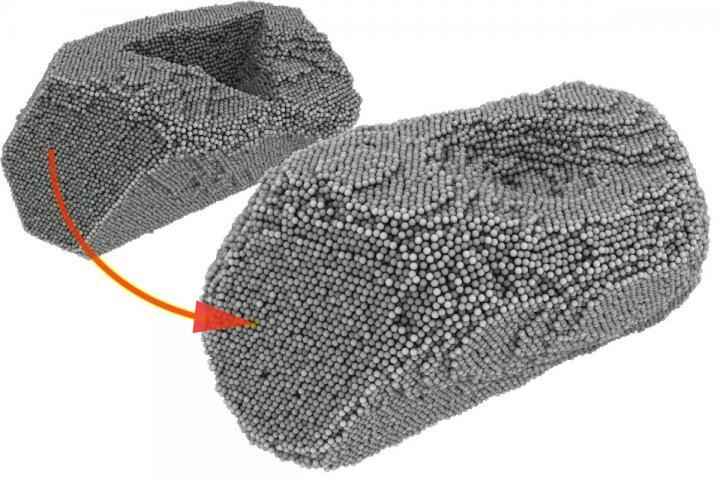 In metal alloys, the shape memory effect is based on the phenomenon that they can exist in two different crystal structures as a function of a specific temperature. When this is changed, the metals "remember" their former shape they had at that respective temperature. However, this self-healing effect is never complete in composites or in alloys. Self-healing or shape memory in pure metals was entirely unknown before. This effect is precisely what a group of scientists around Dr. Christian Brandl (KIT) and Eugen Rabkin of the Technion – Israel Institute of Technology now observed in gold particles. These multi-shaped particles resumed their individual original shapes almost completely. There was no deformation of any kind. "The fascinating thing about this is that the restored particle shapes did not correspond to that with the lowest surface energy, as would have been expected," says Brandl. The scientists had produced mechanical defects in the particles first in simulations by high-power computers and then, in reality, with the measurement tip of a scanning force microscope. They found that annealing air temperatures far below the melting temperature of gold caused gold atoms to move along surface steps back into the dents, refilling them almost completely. Such surface steps occur in many deformed metals. Consequently, Brandl expects also other metals to have the self-healing properties observed here. The scientists anti-cipate that their findings will allow robust components for structures smaller than one thousandth of a millimeter to be designed. Video description: The video shows how, in molecular dynamics simulation, heating of the deformation first applied (dent) produces random movements of the gold atoms (so-called diffusion) slowly healing back into the original shape. The atoms are stained as a function of their height. In the smaller window, those atoms are darkest which moved over the longest distance, which shows that the atoms move along the surface steps. Being „The Research University in the Helmholtz-Association", KIT creates and imparts knowledge for the society and the envi-ronment. It is the objective to make significant contributions to the global challenges in the fields of energy, mobility and infor-mation. For this, about 9,300 employees cooperate in a broad range of disciplines in natural sciences, engineering sciences, economics, and the humanities and social sciences. KIT pre-pares its 26,000 students for responsible tasks in society, indus-try, and science by offering research-based study programs. In-novation efforts at KIT build a bridge between important scien-tific findings and their application for the benefit of society, eco-nomic prosperity, and the preservation of our natural basis of life.